A mild rub is our featured review for Day 4 of Week of Mild – Oakridge BBQ Secret Weapon Pork & Chicken Rub. Michael Trump is the owner of Oakridge BBQ out of Kearney, Missouri. Not only do they have an array of spice rubs that are second to none, they are a Barbecue Competition team that have won over 20+ plus awards. Michael Trump and Oakridge know what they are doing. Before we get into the review of Secret Weapon Pork & Chicken Rub, I want to tell you that each and every one of their products or rubs are packaged in foil packets with a zip-lock style closure. Their quality of packaging is very classy. Texture & Appearance: A very coarse texture but with a consistent grind of all the other ingredients, gives this rub a big, bold look. It covers meat well, and does not shrink down or disappear. The instructions state to “allow rub to fully dissolve before cooking” but on two cooks on wings, I found that it just barely dissolves. I also made the mistake of adding even more rub to our wings after grilling… more on that later. Taste Straight Up: Sweetness, onion and garlic dominate the flavor. This is a complex and savory rub! The spices and an almost umami flavor round out the overall taste. The sea salt comes in strong only as a first taste out of the bag. I’m happy to see the salt, and a “sea salt” at that, coming in as a 2nd place ingredient. So many rubs are salt, salt, salt at first. This rub benefits from the “raw cane sugar” as that is well known to have a higher burn point, and is more forgiving over your coals. Heat Level: The chilies in the mix bring on a level 1 heat. Just enough for overall flavor. This is why this rub is in our “mild” category, and deserved a place in our “Week of Mild” series. Label/Graphics/Packaging: I mentioned the classy zip-top foil envelopes already. As you can see from the pics, the label itself is simply the Oakridge BBQ logo along with big fonts for the titles of rubs, and a clear list of ingredients. It don’t get any classier than this, folks. Overall Rating (Taste on Food, Final Thoughts): I’ve used Secret Weapon Pork & Chicken Rub twice now, both times on some smoke-roasted wings. The end result was a superb, dry rubbed smokey wing. The flavor was complex, savory, sweet and delicious. 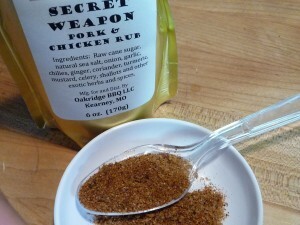 While we’re not competition BBQ cooks (as a matter of fact, we’re just BBQ comp groupies), I can imagine a chicken turn-in with the Oakridge BBQ Secret Weapon rub would give anyone a leg up on the competition. I dusted the wings a final time before serving, and this just made for a bit too much “rub” – I’m so guilty of overdoing things when it comes to rubs, smoke (wood) etc… they would be stellar without the extra dusting. Visit OakridgeBBQ.com and click on “products” for all they have to offer. See the sidebar on their site for details. Like OakridgeBBQ on Facebook and follow @oakridgebbq on Twitter. Oakridge BBQ plans to offer all of their rubs in bulk quantities soon, from 1/2 pound up to 4 pounds!